Finals are nearly over and many of you will be packing up and heading out of Orono this week. While most of you will travel by car others will go by bus, train, or plane to get back to your families for holiday break. But did you know that a century ago almost all of UMaine’s students that were heading home after finals likely traveled by electric trolley? For Throwback Thursday we take a look back at downtown Orono in 1913 and this transportation marvel of a bygone era. In the bottom right of the image you can make out a trolley from the Bangor Railway & Electric Company which had a line that ran along present day Route 2 extending from Old Town through Orono and Veazie and into downtown Bangor. 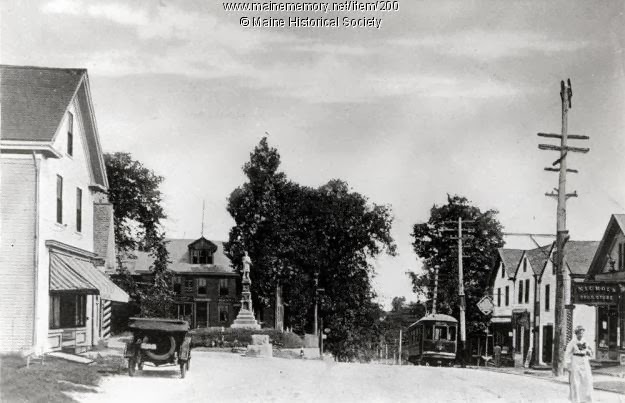 The line ran down Main Street in Orono pass the Civil War Memorial statue which can be seen in the bottom left of the photograph. The trolley would make multiple trips a day from Bangor up to the UMaine campus and paper mill in Old Town, some students made regular daily commutes via the trolley and we can assume parking on campus was much less of an issue because of this (tongue in cheek). Once the trolley arrived in Bangor students could take a short walk over to Union Station, which was built in 1907 and designed by UMaine alumni Elbridge A. Johnston, and board passenger trains to points south. The Maine Central Railroad was the primary tenant of Union Station and had lines extending from the Canadian border down to Portland where the Boston-Maine Railway could bring passengers further down the East Coast. The trolleys would go on to service Orono and Bangor well into the 1940’s when they were slowly replaced by automobiles and bus service. Union Station remained a landmark of the Bangor waterfront up until 1961 when passenger rail service was terminated and the facility was demolished. So as you dig out your car from that snow bank to head home this week keep in mind your fellow alumni who had to ride an open-air trolley in the winter cold to get home.